Since the last newsletter, SDRA has been busy! No matter the season there is much happening here on Smith and Sayles Reservoir. Thank you, Mike Benoit, for controlling the water level in our lake; Art Searle for organizing the data collected by Rico Colaluca and Hunter Dionne on water levels; Janice Baker and the committee on rewriting the SDRA by-laws; Mary O’Keeffe for compiling the fishing tournament data; Carolyn Fortuna for the newsletter, website, grant writing, etc. ; Marissa Danville and Eric LaRiviere for working on our fundraiser in May; and, the effort and time that the Board donates continually. There is always much occuring on our lake, and so many folks make it happen. This leads me to think about the SDRA next events. 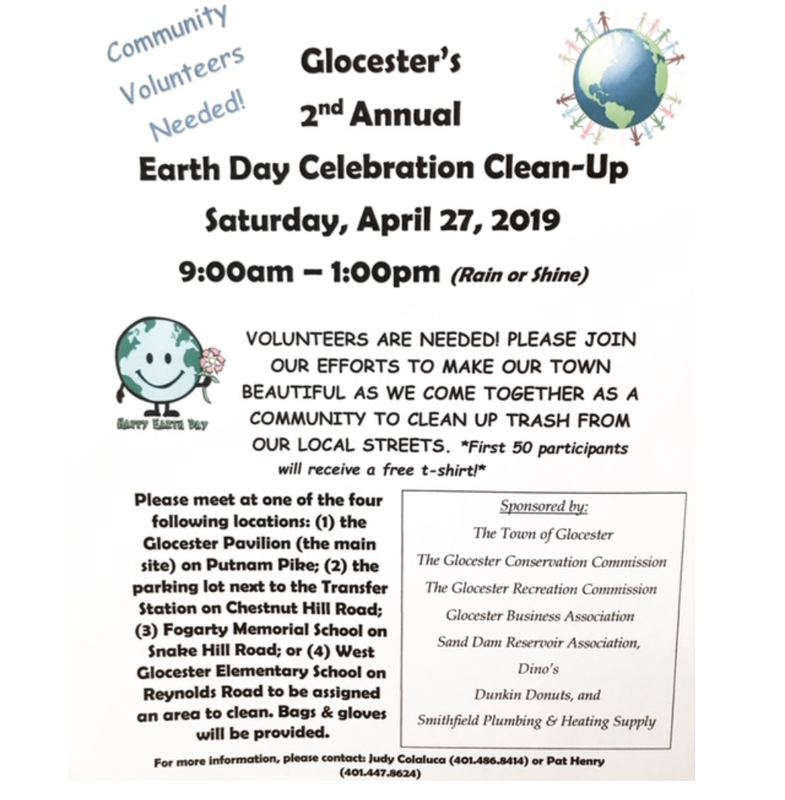 Glocester’s 2nd Annual Earth Day Celebration Clean-Up will take place on Saturday, April 27, 2019, 9am – 1:00pm. Everyone needs to participate to make this a success! SDRA is a sponsor and organizer for this event. The poster for Earth Day Clean-Up is attached for you to put up on your refrigerator and to share with friends and family. Cleaning up our lake and the land that surrounds it is important to everyone. The next event for all to get involved in is a great “FUN” night, a time to enjoy being with friends and neighbors. On May 18, 2019, from Saturday, 5:30 — 8:30 p.m.+ Bella’s Restaurant will be the setting for SDRA’s 6-course dinner with accompanying fine wine tastings led by Kevin Kitson. The entertainment will be the “Black Tie Affair” — the evening event is not to be missed. You can also help by donating items to the Silent Auction. A Poster is attached below..
SDRA’s Annual Meeting is the third Wednesday in June. This is a very important meeting, as there will be a review of the by-laws, a “reflection of the past year,” and election of officers. This is your chance to get involved. Also, a Board majority has selected the company Solitude to do a lake survey this year in case the need for DEM application for herbicide application arise. Judy Colaluca and I represented SDRA at the annual URI conference for individuals affiliated with watershed associations and land trusts, called the Land and Water Conservation Summit, on Saturday, May 9, 2019. It was fabulous! I wrote 2 articles about it: “Wildly Fluctuating Forecasts” & Flooding — A Common Theme Of Climate Change” and “Statewide Perspectives: Siting Renewable Energy Projects Takes Collaboration.” I also attended a workshop on rain gardens and was able to brainstorm possible solutions with the presenters about “Rhode Island Stormwater Solutions.” I recommend that more SDRA members plan to attend next March, as the information presented at these workshops helps to inform the decisions we make here on Smith and Sayles Reservoir. As illustrated in the reports above, we are very fortunate to have such dedicated and forward-thinking individuals in key SDRA leadership positions. As I complete my 6th and final year as SDRA secretary, I continue to be impressed and humbled by the efforts of all of those serving on the board. As we look forward to the 2019 Annual Meeting, we have an opportunity to bring new voices into leadership positions. If there is a change you would like to see, stand for office and work to make that change happen. I hope to see you at the April 27th Earth Day community clean-up. Last year’s event was productive and fun (with an informal competition to see what brand of beer drinkers seem most likely to toss their cans out the car window). It is an excellent way to give back to our beautiful lake community by working together to keep her clean and healthy. Our treasury has been stable this past quarter, with normal operating expenses totaling right around $60 and deposits from dues of $250 and the herbicide reserve fundraiser of $1,250. Thank you to everyone who paid their dues and, if you still need to pay yours, they can be sent to SDRA at PO Box 284, Chepachet, RI 02814. The birds are chirping. It’s a beautiful season here on the lake watching the trees grow green and the perennials pop though the ground. Soon the lake will be in full bloom. I’m excited to see what this season will bring. 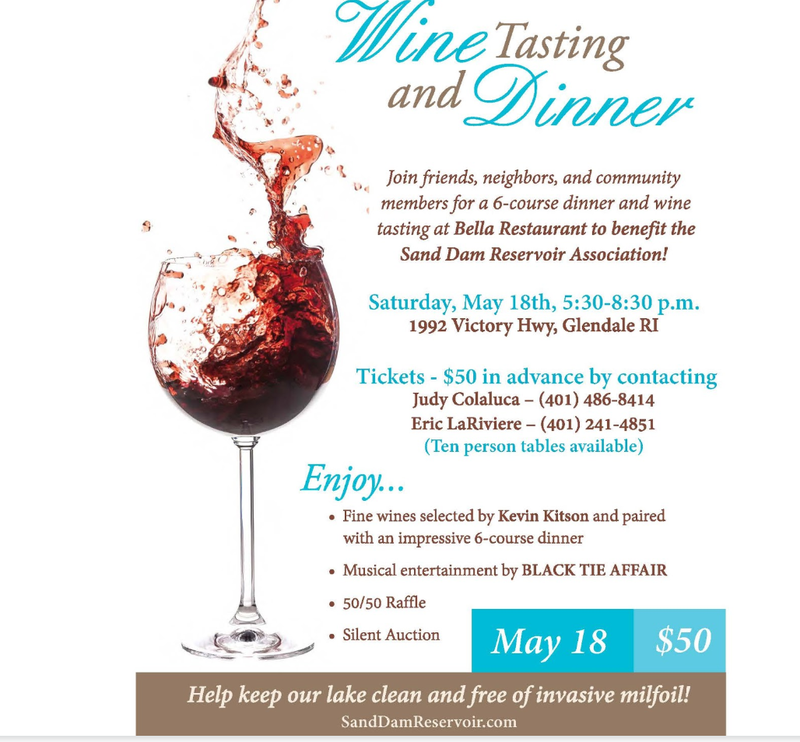 Thank you for your support, and don’t forget to come out to our wine dinner on May 18th! 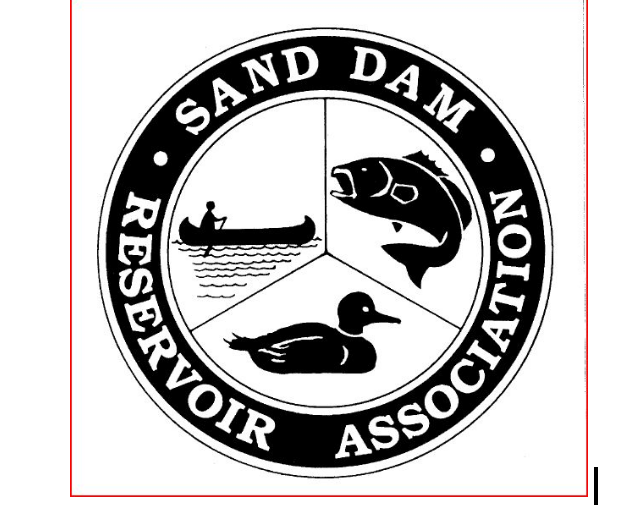 The SDRA continually works hard at improving our lake and community. In order to fulfill this commitment, it takes time, money, and volunteers from our Association. Please consider volunteering at our Community Clean Up day on Saturday, April 27th 9:00am-1:00pm. Each year we pick up hundreds of pounds of litter that surrounds our lake and neighborhoods. Bella’s Restaurant in Glendale will once again host our Annual Dinner and Wine Tasting on May 18th. It has proven to be an exceptional evening of wine, food, and dance. For additional information, please see the poster below. SDRA hired an attorney to assist our Association in a number of areas, one of which was to review our current by-laws to help regain our non-profit status and suggest overall improvements. Mr. D’Olvidio’s involvement was most welcome because our by-laws, to my knowledge, have never had an official, legal review since their inception. At this time, a committee is reviewing the attorney’s work, as well as several ideas that emerged from the Board and by-laws reviewers. Our goal is to present recommendations for membership consideration and approval at the SDRA annual meeting in June. Our annual wine dinner is just around the corner. Join us at Bella Restaurant for a 6-course dinner and wine tasting Saturday, May 18th from 5:30 – 8:30! This event sold out quickly the past 2 years so get your tickets now by contacting Judy (401) 486-8414 or Eric (401) 241-4851. If you have something you would like to donate to the silent auction, please contact Marissa Danville at mjdanville@gmail.com or (401) 632-7780. This night is sure to be a blast. I look forward to seeing you all there! We revised last year’s membership postcard on Vistaprint to reflect the dues increase from $50 to $100 and ordered #50 at a cost of $22 plus postcard postage. Marissa updated the membership list to reflect recent dues paid. Carolyn addressed and sent them out for mailing. Marissa will keep the remaining blank postcards for future use. “According to several sources, this herbicide has moderate acute toxicity, is a potential groundwater contaminant, possible carcinogen and probable endocrine disruptor/estrogen mimic in certain amphibians and people. 2,4-D has been shown to reduce the rate of survival in ducks and waterfowl, is toxic to some fish and causes mortality in crayfish, many mussel species and certain insects and zooplankton”(Rebecca Nystrom, Professor of Biology (retired), Member of the Chautauqua Lake and Watershed Management Alliance Science Advisory Committee, Jamestown Post-Journal, 2017). In spring of 2012 I responded to a training announcement from Save the Lakes that read “Volunteer lake greeters are the first line of defense in stopping the spread of aquatic invasive species in Rhode Island fresh waters.” Since that time we have talked with hundreds of visitors to our beautiful lake, educating them about the problem of aquatic invasive species and helping them inspect their boats and remove “aquatic hitchhikers.” The SDRA Boat Greeter/Voluntary Inspection Program will be getting the list of 2019 fishing tournaments soon. I hope you will consider joining us this season in this important, sustainable, education and outreach effort to help control the spread of invasive species in our lake. Winter 2018-2019 was the year of the un-drawdown. There was simply too much precipitation to lower the water level beyond 47 inches lower than capacity. 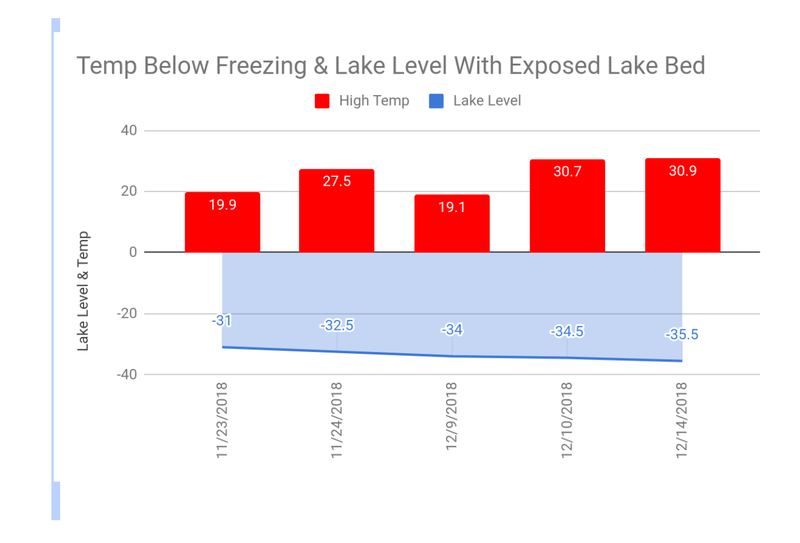 There were five days when the high temperature was at freezing or below and the lakebed exposed, but the lowest level was a mere 35 inches below capacity. See the included chart. The lake is currently refilling. The drawdown remains part of our lake management strategy and we intent to continue the practice next year. If you have not done so, please sign up to receive an email anytime we post a notice on our website through blog posts. Go to this home page and enroll in the right column. It’s really easy! I’ve been posting notices of meetings, for example, which are open to all members. If you are signed up to receive blog posts, you’ll get a copy of these notices as well as other information that is disseminated on behalf of the Association. The Herbicides Committee is pleased to report that a major fundraising drive this year has achieved approximately $5000 in payments and pledges! These dollars will be added to the funds already earmarked for herbicides application. As you may recall, last year SDRA authorized herbicides application to treat 46 acres of unwanted, disruptive milfoil. Both research and experience have taught us that follow-up treatments will likely be needed sometime in the future, and that work is not cheap. So, like the Scouts motto – “Be Prepared” – we will have the funds in place if needed, for more than one additional treatment. Thanks to all who helped make this fundraiser such a success. Currently this Committee is working with the Board to put in place the necessary paperwork for DEM to enable the application of herbicides this year, if deemed needed by the survey and approved by the Board. As always, our committee hopes that other strategies underway can abate the milfoil problem sufficiently without the use of herbicides. Restore America’s Estuaries: In an attempt to locate additional funding for SDRA, I attended the Webinar for “Restore America’s Estuaries: 2019 Southeast Program, Watershed Grants.” This turned out to be a program for very large grants — generally of $100,00- $500,00. Smaller grants would be for bigger scale projects that need additional funding to complete. A special category this year called “peer to peer learning” of a regional importance of around $20,000 to $50,000 would be considered for smaller funding. This program “is not interested in funding small projects,” like a $20,000 stormwater project. After attending the webinar, I recommended to the board and to our partner, Save the Lakes, that this grant application was not a good fit for us. The grantors were really looking for big organizations/ entities with big projects. It cannot have a localized impact — it must show upstream and downstream impacts. 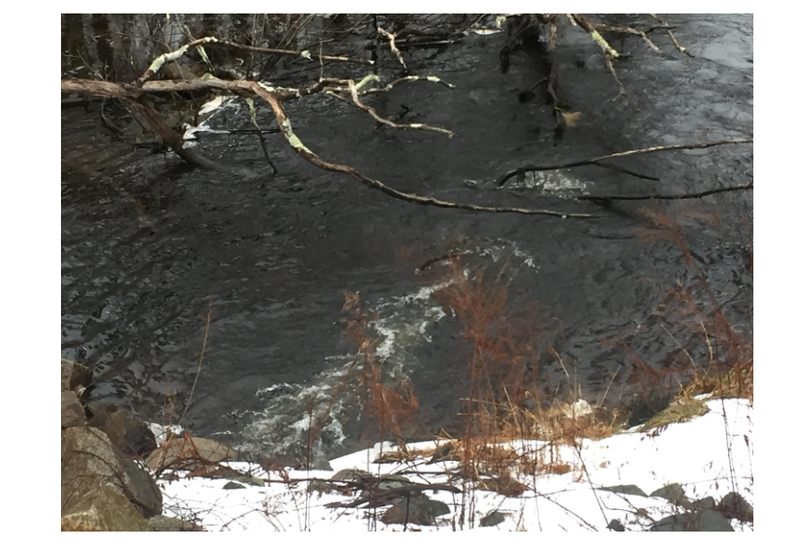 Rhode Island Foundation: We have some information back from RI Foundation regarding our recent grant application for swale and rain ponds — good news and bad news. I’ll give the bad news first: we did not get the grant. But here is the good news: the reviewer said the grant as a whole was really good! She said the biggest impediment was that it was ineligible — they do not fund construction, and they considered the swale and rain ponds to be construction. That being said, she said she liked a lot about the grant and organization. In no particular order, she said that she was impressed with the website and the organization of volunteers. The application was well-written. The Association mission was clearly stated. We had a specific series of lessons we intended to learn and that we would be able to share with other entities/ Associations. She could see the benefit of the rain and swale ponds in this way to the larger state. She also had some advice for future grant writing. Because we are a small organization, it seemed, on first glance, that the benefit of the grant was quite limited. However, if we were to speak about public access, we would be able to talk about more numbers of people who would benefit, such as those that use the state boat ramp. She also said that we should try to be more specific when using consultants and to provide a scope of work — in this case, we might’ve outlined better how one landscape architect would need to do X number of hours as opposed to the landscape engineer, who would need to do Y number of hours. As a whole, while I was disappointed in not receiving the grant on behalf of SDRA and STL, I did feel as if our research and writing was appropriate to our goals. If anyone comes across another small grant that might fund such rain and swale pond construction, please let me know. We’re not done yet, people! Thanks to each person on the committee who contributed to the grant writing process. All members, this is the time to think if you would like to be part the Board. Now is the time to speak up and submit your name to the nominating committee. Save The Lakes is busy planning the Annual Meeting on April 23, 2019 6:30 – 8:30 pm at the Johnston Senior Center 1291 Hartford Avenue, Johnston, RI 02919. This meeting is open to everyone concerned and interested in preserving, protecting, and improving freshwater here in Rhode Island. This year the focus is on DEM office of Water Resource staff explaining changes in the freshwater wetland regulations, answering questions, addressing our issues, and updating us about their activities. Also , we will learn learn more about the Lake Smart RI Program that is piloted here on Smith and Sayles Reservoir through SDRA. And Resident Initiative will be part of our conversations, too. Come meet other RI waterfront residents and share solutions and ask questions about waterfront problems. Janice has spent much time on studying, reviewing, writing and rewriting SDRA’s By-Laws. This needs to be completed for our organization to apply for a 501(c)4 status. Janice held many meetings with her committee and with the SDRA Board. Her persistence and dedication to excellence is commendable and a positive attribute for our organization. Thank you, Janice, for all you do! As SDRA moves forward, it has been and will always be my honor to serve in preserving, protecting, and improving OUR lake. This entry was posted in Community Advocacy, Fund Raising, newsletter and tagged boat inspection program, fundraising, Invasive species, Lake Management, Smith and Sayles Reservoir. Bookmark the permalink.